Achuthan Ramachandran Nair, popularly known as A. Ramachandran was born in 1935 in Attingal, Kerala. In 2005, he was awarded the Padma Bhushan, India’s third highest civilian honor, for outstanding service to the nation. 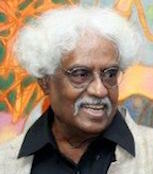 In 2002, he was elected a Fellow of the Lalit Kala Akademi. As a painter, his strong command over lines, colours and forms create an exciting visual drama. Ramachandran's canvases are vibrant with a sense of teeming, burgeoning life. The artist's quirky sense of irony imbues his paintings with a piquancy and feeling of new discoveries. As one who considered Ramkinkar Baij as his guru, Ramachandran has created sculptures which are even more intriguing in formal terms than his paintings.